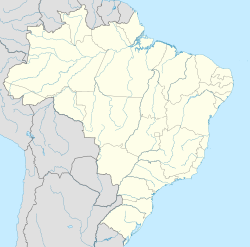 Osasco (Portuguese pronunciation: [oˈzasku]) is a municipality an ceety in São Paulo State, Brazil, is locatit in the Greater São Paulo an rankin 5t in population amang São Paulo municipalities. The current mayor is Antonio Jorge Pereira Lapas (PT). The population in 2008 is 713,066, the density is 10,970/km² an the tot aurie is 65 km². It is amang the warld mair dense ceeties, similar in density tae Tokyo an New York Ceety. It's considered the major urban centre o the Wastren portion o the Greater São Paulo. It uised tae be a destrict o São Paulo Ceety til Februar 19, 1962, when Osasco acame a municipality o its awn. In 1989 the ceety acame the seat o the Roman Catholic Diocese o Osasco. Wikimedia Commons haes media relatit tae Osasco. This page wis last eeditit on 10 Mairch 2018, at 19:25.